What you going to give? "Test me in this," God says. Go ahead and tithe and then just sit back and watch as God proves His existence, His power, His mercy, His resourcefulness, His cleverness and even His humor sometimes. Reading Malachi 3:10 reminded me of a moment in my life that God did just what he promised the Israelites. During my college years, money was tight to say the least. My weekend job provided just enough money to keep gas in my car and a week's supply of cereal and macaroni and cheese in the cabinet — just the staples, you know. I felt that I would surely be excused from tithing. God couldn't possibly expect me to give money in church on Sunday when I barely had enough to get by. He knew how tough college was. He knew that I was planning to give back as soon as I got out of school and was able to get a good-paying job. He would want me to have enough money to buy food, so he surely didn't expect me to give it all to him at church. That would be absurd, right? One Sunday, as I listened to the minister's message on this very subject, the people around me seemed to disappear. I felt God tugging at my heart. Even then, I tried to explain: "God, I know I need to give, but any week but this week. On top of everything else, I've got a speeding ticket to pay for and I don't get paid this week!" All during the church service, God never let up. I felt moved to relinquish my worries and give back to Him. When the number popped into my head, I laughed as I realized that He was even specifying the amount. I wrote a check for sixty dollars, the same amount of the speeding ticket. I knew that He was challenging me to challenge Him. Vividly, I remember thinking as I quietly tore the check from the book, "Okay, here goes nothing. It's all Yours. Now You know that I don't have anything left." As if God didn't know, but I still felt the need to state my case. The service came to an end and I walked out to the crosswalk towards the car. 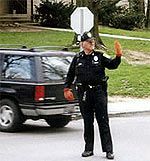 The patrolman, standing on the opposite side of the busy road, held up his left hand motioning for the traffic to stop as people gathered outside the church building. As the cars came to a stop, a large group of us safely crossed the road. The closer I got to the patrolman, the more he began to grin. He raised his right hand and motioned for me to come to him. Grinning back inquisitively, I reluctantly walked towards him. He chose to utilize my own mistake. "So," he said as he wrapped his husky arm around me. "Your Dad told me you've had a little trouble with the law this week." He said, unable to keep a straight face. "Do you have the ticket with you?" he asked and I nodded sheepishly. "Give it to me. I'll see if I can take care of it since it's your first one." Excitedly I dug through my bag and handed him the paper and thanked him with a hug. "Now get out of here before you get run over. And slow down!!" As I trotted off to the car, I just laughed. God had not even let me get to my car before He proved to me that He would take care of me; and of all the ways He could have done it, He chose to use my own mistake. Not only had He tenderly proved that I could trust Him, but He threw in a little mercy to boot. Now just as I would not intentionally speed foolishly thinking that my friend would tear up all my tickets, so I will not intentionally spend all of my money, foolishly thinking that God will just replenish it for the asking. I'm still amazed, however, at the perfect moments in life that He chooses to teach priceless lessons about His love for us. "Now That's the Ticket" by Kelly Breece is licensed under a Creative Commons License. Heartlight encourages you to share this material with others in church bulletins, personal emails, and other non-commercial uses. Please see our Usage Guidelines for more information.